I believe it is supposed to come out on DVD in March. That photo strikes fear into my heart. The dreaded trainer. Skiing, snowshoeing, even running is preferable. The race plate is a nice motivational touch. 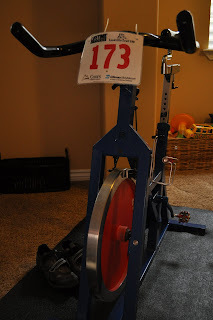 By the way, the race plate on the spin bike is a joke. Just wanted to be clear...But if you look closely, you will notice it is a Leadville plate. Is that Dug's spinner or did you just get one? My wife's got some spin video's choreographed nicely to some obnoxious techno music that your welcome to borrow. I dig the race plate on the spinner - nice touch! You should take that to a spin class at the gym - it would intimidate the guys that show up in full team kit. You want to race? I could bring my spinner over...might be the only thing that can get me to ride it.